Taliq, a nine-year-old boy battling cancer, got a birthday message from his favorite NBA player Wednesday. Then on Wednesday, Taliq got a message from his favorite NBA player. Golden State Warriors star Stephen Curry wished Taliq a happy birthday and speedy recovery via a video message on Twitter. Taliq's mother Tanisha wanted to make his tenth birthday a special one because she believes little words of encouragement will help him battle his cancer, KWTX reported. So she asked everyone she knew — and strangers — to send him birthday cards. Doctors diagnosed Taliq with diffuse intrinsic pontine glioma on Feb. 18. DIPG is a type of brain tumor found in the pons, part of the brainstem on the lower back of the brain, KWTX reported. Taliq gained 55 pounds since his diagnosis. 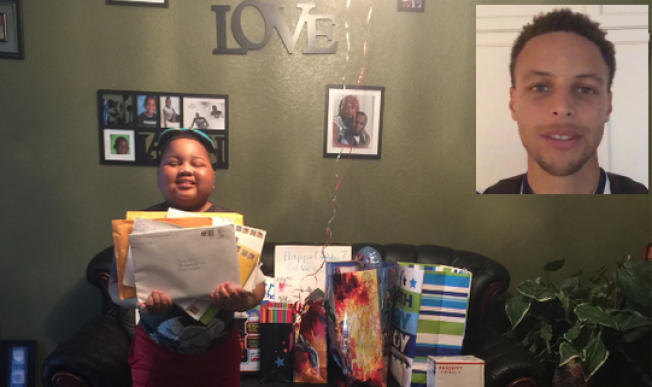 Taliq's mother said that the birthday cards and gifts — some which arrived all the way from Australia — immediately made him feel better. Taliq didn't complain about a headache for the first time in months. "Tears just came to my eyes because as a mother, I have been waiting four months to wait to hear him say those words," she told KWTX. Taliq's mother Tanisha has set up a Go Fund Me site for her son.